The final siren sounds with Hawthorn defeating Collingwood by 47 points. No prizes for guessing who the premiership favourites are. GOAL HAWKSBreust takes amar in mid air flying like a hawk! He bananas the kick through and it's party time and high fives all around for the Hawks. GOAL MAGPIESJolly takes a good mark on the lead. He goes back and splits the middle with a beautiful looking kick. He has two goals. BEHIND MAGPIESFasolo marks just inside 50 but his shot misses to the left. 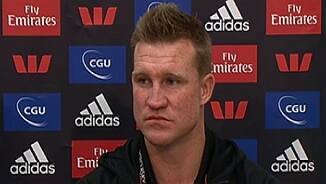 Dane Swan has accumulated big time today. He has 47 possessions. BEHIND HAWKSSavage marks it inside the boundary and he hits the post with the shot. 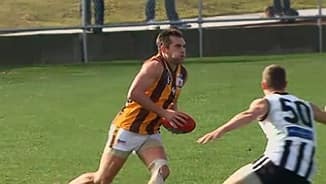 BEHIND MAGPIESBeams is taken high and has a chance for a career best 5 goals. He lines it up, it starts left and stays left. GOAL MAGPIESSwan bounces and runs to the 50. He kicks the goal with his 45th possession. What a player. GOAL MAGPIESJolly wins the free kick for holding the ball in the ruck contest and kicks his first for the afternoon. BEHIND MAGPIESFasolo snaps from 40 metres out and he misses to the right. GOAL MAGPIESSwan gets the clearance and he kicks to the 50 where Beams runs onto it and kicks long. The shepherd is provided and it's through. GOAL HAWKSThe ball is kicked long to the square where Rioli sprints. It bounces up for him nicely and he kicks it. 83,714 is this afternoon's attendance. The third highest between these sides. BEHIND MAGPIESDawes tries the qucik snap but he misses to the left. GOAL MAGPIESCloke marks in the goal square. Yes that's the player who is in the middle of contract talks. He kicks the goal and looks none to happy with himself. Puopolo runs off after kicking the goal and is immediately subbed off and replaced by Savage. GOAL HAWKSPuopolo takes one high and is paid the free on the boundary. Surely he can't kick it from there. OH YES HE CAN! WHAT A MAGNIFICENT GOAL! BEHIND HAWKSGunston tries to burst through to kick another, but he misses to the left. GOAL HAWKSBreust brings down Shaw with a magnificent tackle. The recipe says For prfect result, kick goal and that is exactly what he does! Hawks by 61. BEHIND HAWKSRoughead takes possession and ground level and handballs to Lewis who snaps, but misses to the right. BEHIND MAGPIESA rushed behind gets the scoring underway for the final quarter. GOAL HAWKSThis is an unbelievable turn out by Lewis this afternoon. He approaches the marking contest with confidence and wins the free kick from which he kicks his fifth. GOAL MAGPIESMooney runs inside 50 and is tackled. He handballs to Beams who gets the shot out in time under pressure, but it's a great kick. He has 3 out of Collingwood's 8. GOAL HAWKSRoughead marks on a lead with plenty of space in front of him. He goes back and slams it through for his third goal. 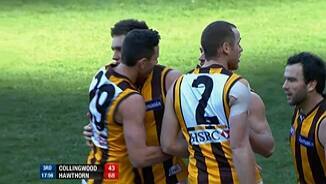 GOAL HAWKSRioli is just a magician. Simple as that, no further questions your honour. He somehow is able to thread the handball to Young to kick the goal from 25 metres out. GOAL MAGPIESBurgoyne turns it over to Pendlebury who passes to Thomas all by himself. Thomas kicks the goal but Collingwood have a mountain to climb with a 43 point deficit. BEHIND HAWKSYoung from 50 metres out can make the distance without problem. The accuracy is what is missing on this occasion. 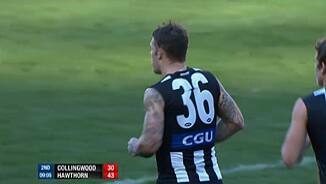 Collingwood have made their substitution with Mooney coming on for Brown. GOAL HAWKSLewis takes a good contested mark 40 metres out. He is lining up for goal number 4 and just manages to sneak it in. Hawthorn holds a 48 point lead. Lance who? GOAL HAWKSLewis takes possession in the pocket. He bursts through the pack and manages to sneak the snap in and it's a beauty. He has three goals and the Hawks are on fire! Collingwood are in deep trouble here and it's difficult to see a way back for them such is Hawthorn's dominance. GOAL HAWKSFrom the boundary throw in the ball goes to Breust on the line. He kicks alow bouncing ball that trickles through. How did he do that? GOAL HAWKSThe Hawks look threatening here. Lewis marks 35 metres out. He sees Murphy running past and handballs it out to him. Murphy finishes off the job. Hawks by 30 points. BEHIND MAGPIESDawes marks it 35 metres out but his shot misses to the right. GOAL HAWKSGunston presents deep in the pocket and he takes the mark. This would be a great start to the second half for the Hawks if he can kick it and he does exactly that. The siren sounds for halftime with the Hawks leading by 19 points. BEHIND MAGPIESAnother rushed behind for the Magpies. This match has promised a lot and deliver a lot more in the first half. GOAL HAWKSRioli gets to the football first. 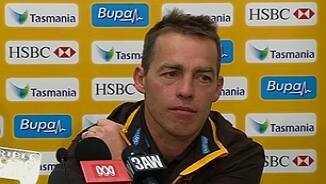 He kicks to Young who hears the call of Roughead and handballs to him in the goal square. Roughy finishes it off. GOAL MAGPIESBrilliant stuff by Pendlebury to handball to Beams on his way through. 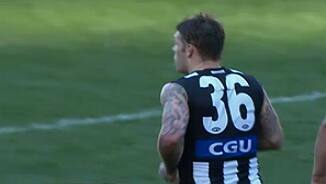 Beams' snap is a cracker and the Magpies again throw another challenge. BEHIND HAWKSRoughead marks it 30 metres out with a slight angle. He lines it up and misses to the left. Roughead can be like that sometimes. GOAL HAWKSGunston draws an opponent and handballs over the top to Breust who runs in to kick the goal. The Hawks are definitely in for the fight and lead by 19 points. GOAL HAWKSRoughead moves forward and it has paid instant dividends. He takes a very good contested mark in between 2 Magpies and kicks the goal to steady for the Hawks. GOAL MAGPIESSwan kicks it through traffic. It takes a very favourable bounce and it's through for a goal. Magpies keep coming. BEHIND HAWKSBreust tries to go off the ground but it bounces the wrong way. GOAL HAWKSSome Rioli magic presents the ball to Breust who loves a goal. He also loves a celebration and the Hawks lead by 12 points. BEHIND MAGPIESCloke marks strongly out near the boundary. His shot at goal is across the face. Collingwood are on their way back and have had all the play in the second quarter. GOAL MAGPIESA Gibson brain fade, kicking to a contest in short distance turns the ball over. Beams marks on the paint work and the kick is a beauty. BEHIND MAGPIESElliott marks it 30 metres out directly in front but his kick is a poor one. BEHIND MAGPIESAnother rushed behind for Collingwood with the Hawks under pressure. BEHIND HAWKSYoung rushes it through for a behind to get the scoring underway for the second quarter. The siren sounds for quarter time with Hawthorn kicking 5 goals to 3 to lead by 16 points. GOAL MAGPIESSuckling's kick out is poor as Dawes contests the ball. It spills free with Tarrant turning back the clock to pounce and snap it through for a very important goal. BEHIND MAGPIESDawes marks it in the pocket but his shot misses to the left. GOAL HAWKSGunston takes a spectacular mark but doesn't wait. He handballs off to Lewis who has time to steady and pop it through. Hawks are playing champagne football. 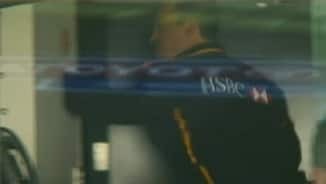 BEHIND HAWKSBreust runs in after exchanging handballs but his kick from 35 metres out fades at the last moment. BEHIND HAWKSMitchell tries one through traffic, but it's not his best effort. BEHIND HAWKSPuopolo is taken high and is paid the free kick 30 metres out. He leans back and misses to the right. GOAL MAGPIESAn error by Murphy sees Dawes take possession. He kicks a bouncing, rolling sort of kick that Jolly just stands there and watches bounce through. Big risk but pays off. BEHIND HAWKSReid rushes the ball over for a behind. GOAL HAWKSGunston is paid the free kick in the marking contest. He has kicked 14.2 in set shots this year. Make it 15.2! He is a good kick and the Hawks get away. GOAL HAWKSSuckling kicks long across the ground to find Lewis who keeps running. He gets to 50 and kicks a tremendous goal. Hawthorn lead by 14 points. BEHIND HAWKSYoung marks it on the 50 metre line out near the boundary. It starts on the right goal post but drifts across for a behind. A big crowd is out in attendance on a nice sunny winter day in Melbourne. GOAL HAWKSGunston calls for it drifting across half forward and his lead is honoured. Gunston, in the famous number 19 guernsey, kicks it through for a nice goal. GOAL HAWKSMtchell gets it out of the middle. Sewell is the beneficiary and he dodges and weaves his way through traffic. He kicks from 55 and it's a beauty. BEHIND HAWKSMurphy kicks it around his body and it fades for a behind. GOAL MAGPIESSidebottom takes the mark and carefully guides it through for a goal. He very rarely lets you down. We are off and underway at the MCG. One late change for both sides with Sinclair and Gilham replaced by Mooney and Savage respectively. Both Mooney and Savage are the nominated substitutes. Good afternoon and welcome to the MCG for the massive Collingwood vs Hawthorn clash.